Edited by Deniz Ekinci . Biochemistry includes the chemical processes in living systems which govern all living organisms and living processes. 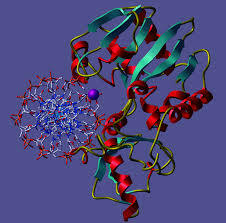 It deals with the structures and functions of biomolecules. Over the recent years, biochemistry has become responsible for explaining living processes such that many scientists in the life sciences from agronomy to medicine are engaged in biochemical research. The main focus of biochemistry is in understanding how biomolecules give rise to the chemical processes that occur within living cells. Although extensive research has been performed on biochemistry for many years, there is still deep need of understanding the biochemical reactions as well as the structures of biomolecules. This book titled “Biochemistry” contains a selection of chapters focused on the research area of proteins, enzymes, cellular mechanisms and chemical compounds used in relevant approaches. The book provides an overview on basic issues and some of the recent developments in biochemical science and technology. Particular emphasis is devoted to both theoretical and experimental aspect of modern biochemistry. The primary target audience for the book includes students, researchers, biologists, chemists, chemical engineers and professionals who are interested in biochemistry, molecular biology and associated areas. The textbook is written by international scientists with expertise in protein biochemistry, enzymology, molecular biology and genetics many of which are active in biochemical and biomedical research. I would like to acknowledge the authors for their contribution to the book. We hope that the textbook will enhance the knowledge of scientists in the complexities of some biochemical approaches; it will stimulate both professionals and students to dedicate part of their future research in understanding relevant mechanisms and applications.